Getting up relatively late on 12 August 2007, I was undecided about what to do for the day--go scrambling or sit home all day watching the final round of the PGA Championship on TV. I drove my wife to a nearby antique mall so she could pick up an old mirror before I finally opted to head for the hills and get some exercise. 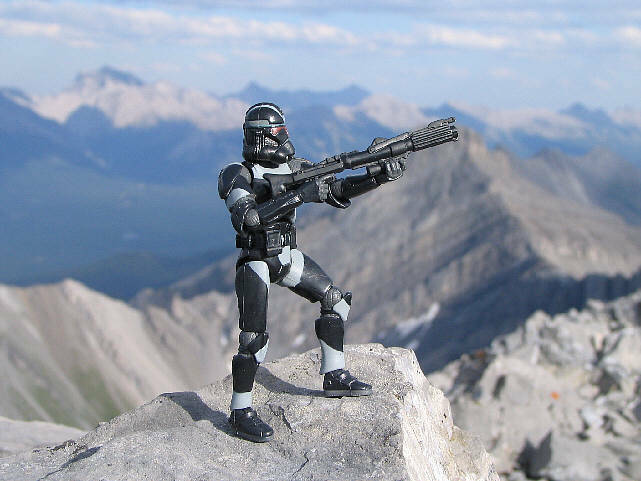 My original plan was to scramble up Mount Inflexible in Kananaskis Country via the same route as Mount Lawson, but when I turned onto the road to Fortress Ski Area, I was dismayed to find that the bridge over the Kananaskis River was temporarily closed to motorized traffic. Although the start of the route is only a 300-metre walk up the road from the bridge, I was too lazy to walk this short extra distance. 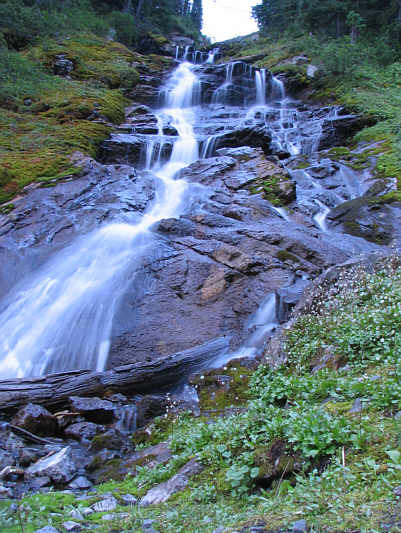 Instead, I drove into Peter Lougheed Provincial Park and illogically considered taking the much longer approach to Mount Inflexible via James Walker Creek (though longer, this route theoretically does save about 275 metres of elevation gain). My enthusiasm for scrambling started to wane around here, and I was again racked with indecision. I had Andrew Nugara's new guidebook with me and noted that Mount Kent is described as a fairly short outing. Great! I could bag a peak and still make it home in time to catch Tiger Woods on the back nine holes, or so I thought. 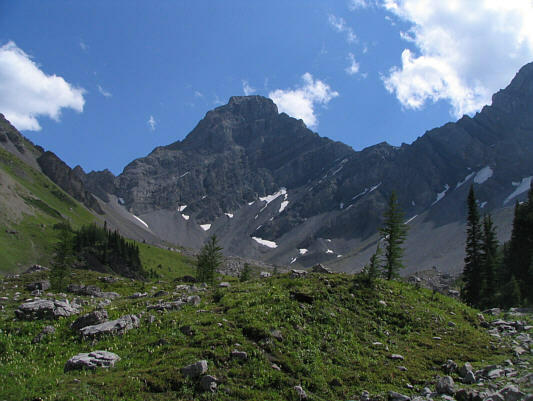 As I drove past the Mount Black Prince day use area in search of the double drainage marking the starting point for ascending Mount Kent, I recalled my lengthy outing on Mount Warspite and Mount Invincible and even began entertaining thoughts about scrambling up Mount Black Prince. 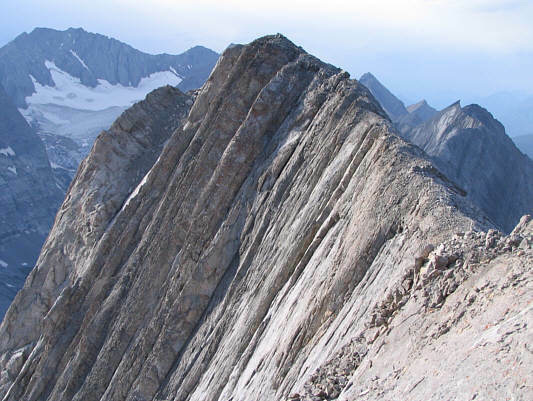 I knew that fellow climbers, Bob Parr, Andrew, and, most recently, Antri Zhu, had all ascended this peak, but my recollection of their route descriptions and photos was vague at best. Nevertheless, I was intrigued enough that when I missed the double drainage (perhaps on purpose subconsciously), I simply turned my car around and headed to the Mount Black Prince day use area. 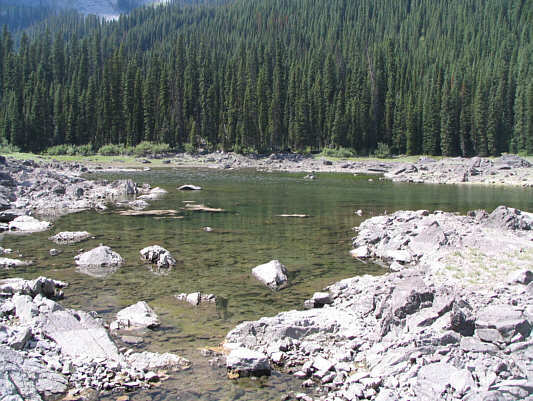 During my hike to Black Prince Lakes, I tried to muster every last bit of information I could recall about the ascent route, but other than knowing that I was on the right side of the mountain, I had little else to hang my hat on. 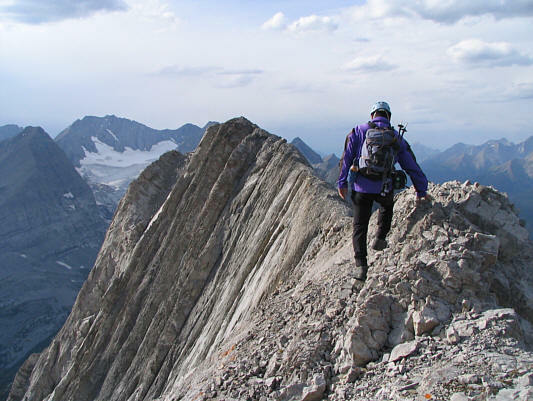 When I neared Black Prince Lakes, I could see a grassy ridge running up to the northeast face of Mount Black Prince, and I suddenly remembered one of Antri's photos which showed this same ridge. I took a break on a scenic nub overlooking Black Prince Lakes and studied the impossibly steep northeast face with growing uncertainty. Thoughts of heading home swirled in my head, but I decided that I owed it to myself to at least hike up the easy grassy ridge and take a closer look. 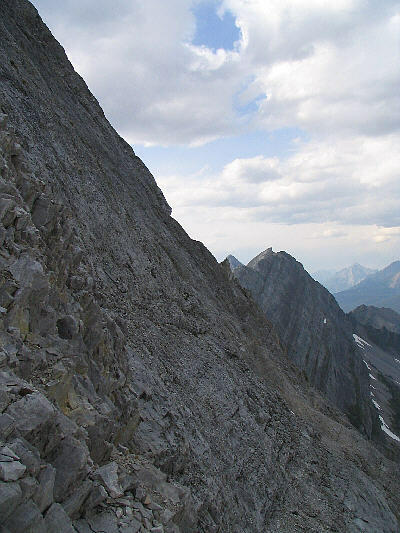 When I eventually reached the base of the northeast face, I saw a few possibilities for reaching the summit ridge, but I was keenly aware of how deceiving routes can look from a foreshortened perspective. Nevertheless, I started traversing to climber's left to avoid a large snow patch, and before I started scrambling in earnest, I built a small cairn not so much for route-finding purposes but as a token of reassurance. I made fairly good progress initially and zigzagged up the lower face looking for whatever weaknesses presented themselves to me. As I scrambled higher though, good holds and ledges became scarcer, and one particular rock band (crux) near the top proved to be both challenging and unnerving. After surmounting this obstacle, I had no further difficulties gaining the summit ridge and subsequently the summit. On descent, I chose to down-climb a little further to skier's left of where I ascended mainly to avoid the aforementioned rock band. 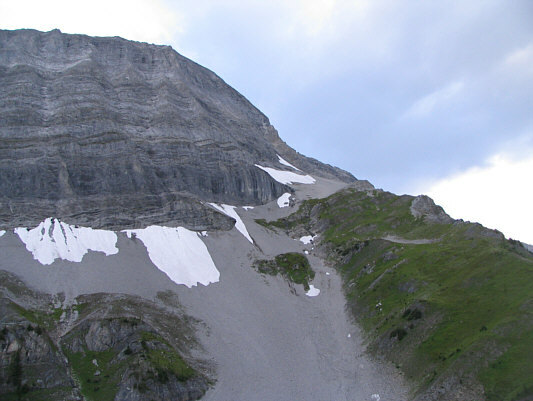 However, this route was not without its share of challenges. 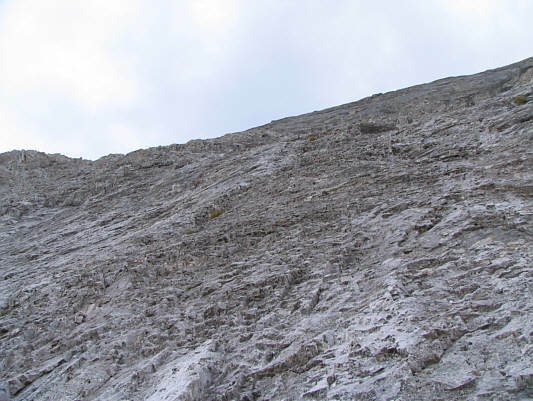 The crux of my descent was a steep wall about halfway down the northeast face. Trustworthy holds were miniscule at best, and much of the rock was down-sloping. My only option was a very narrow and shallow crack, and I had to descend this facing into the rock. A slip here would definitely have been catastrophic if not fatal; thus, I took my time descending and tested every handhold and foothold carefully. Although this was by far the hardest part of the descent, there were a few more tricky sections further down, and only when I finally reached my cairn did I start to breathe easier. With the worst behind me, I had an uneventful hike back to the trail head (round-trip time of 7.5 hours). 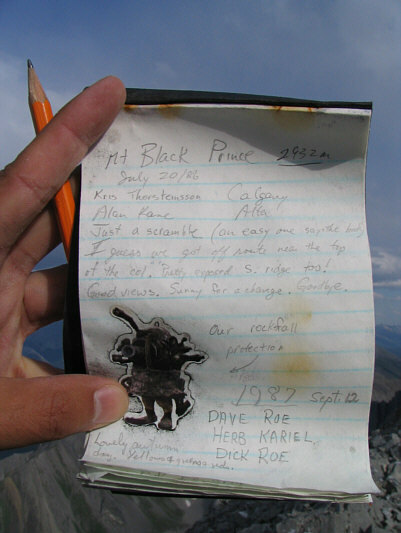 While I missed seeing Tiger Woods win the PGA Championship that day, bagging Mount Black Prince seemed like a major victory to me. Warspite Lake actually has some water in it on this day. Mount Warspite looks dark and brooding at the head of the hanging valley. 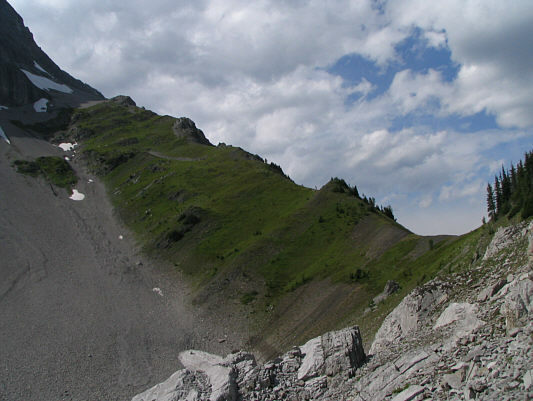 This is the grassy ridge that abuts the northeast face of Mount Black Prince. 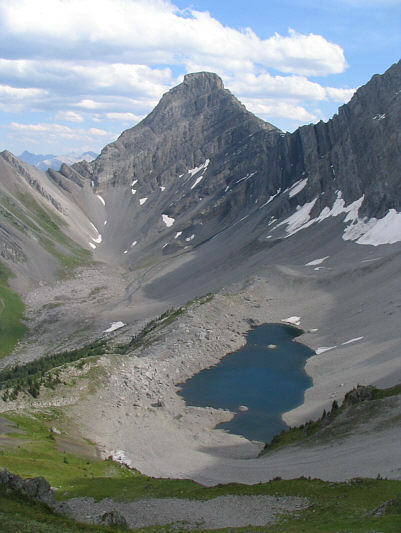 Here is a view of Mount Warspite and Black Prince Lake as seen from further up the grassy ridge. 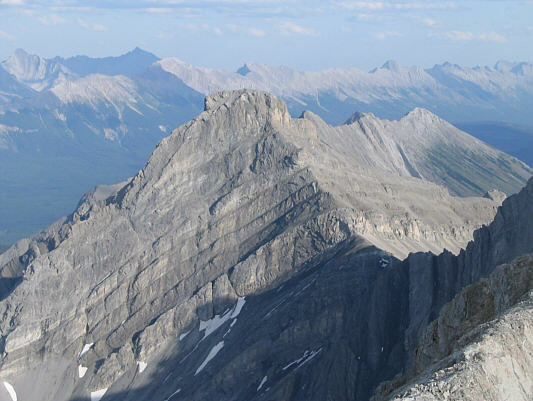 The northeast face of Mount Black Prince looks impregnable. 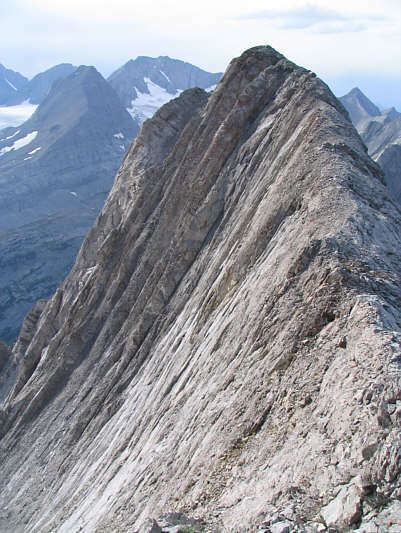 This photo gives a good indication of the steepness of the northeast face. 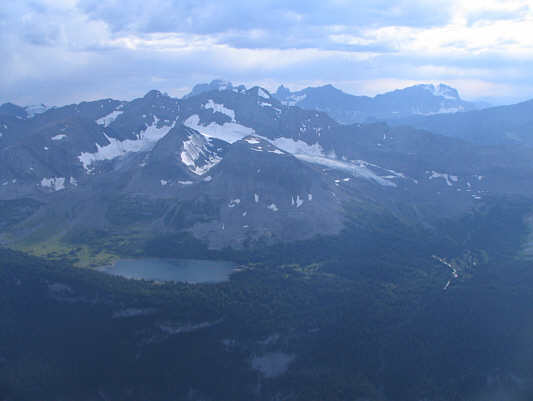 From where Sonny gained the summit ridge, this is looking southwest toward Lawson Lake, Mount Beatty, and Mount King George (on horizon). Sonny heads for the summit. 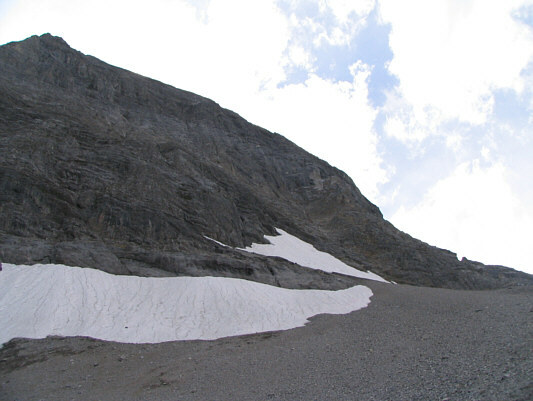 The final section along the summit ridge is quite exposed. 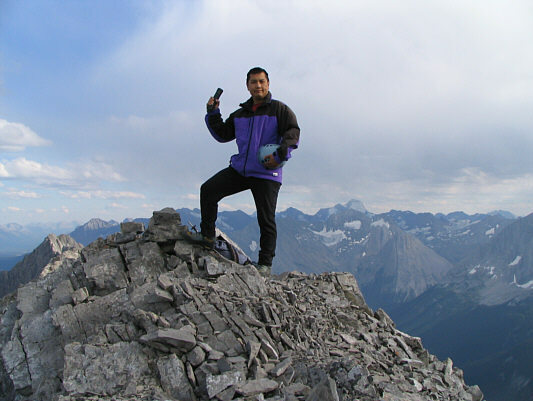 Sonny holds up the register canister on the 2932-metre summit of Mount Black Prince. Mount Joffre is visible on the horizon. The register placed by Kris Thorsteinsson and Alan Kane in 1986 is still there. This is looking southeast from the summit. 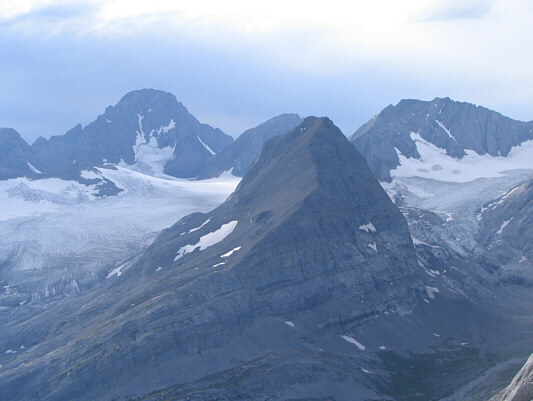 To the northwest, Mount Jellicoe is flanked by Haig Glacier and Smith-Dorrien Glacier. In behind are Mount Sir Douglas, Mount Robertson (nearly hidden), and Mount French. 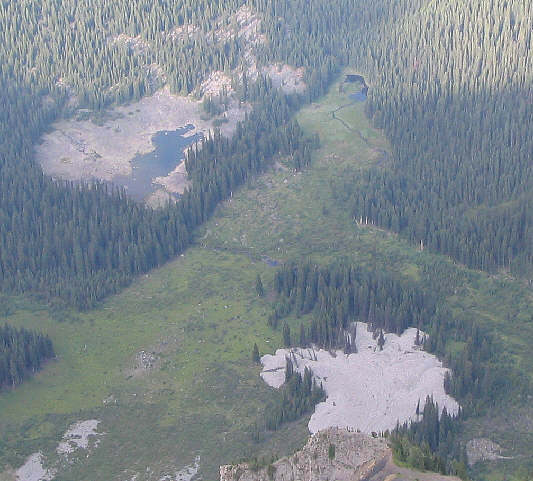 This is the view of Warspite Lake (upper left) from the summit of Mount Black Prince. Mount Warspite dominates the view to the southeast. 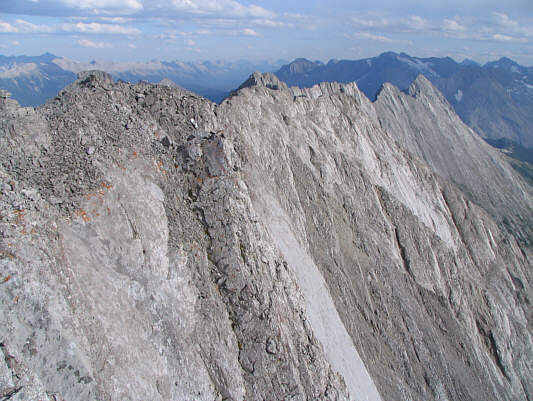 The north and south peaks of Mount Indefatigable are also visible to the right. Sonny heads back along the summit ridge. 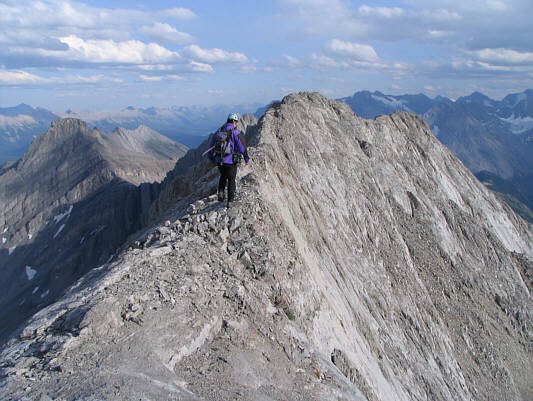 Here is one last look back at the summit of Mount Black Prince. This is looking up from the base of the wall Sonny had to down-climb. 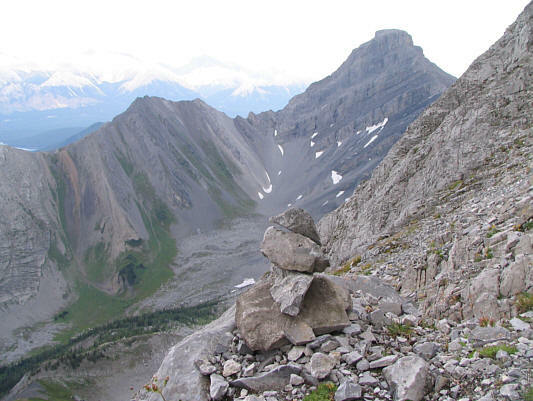 Sonny built this cairn near the bottom of the northeast face on his way up. 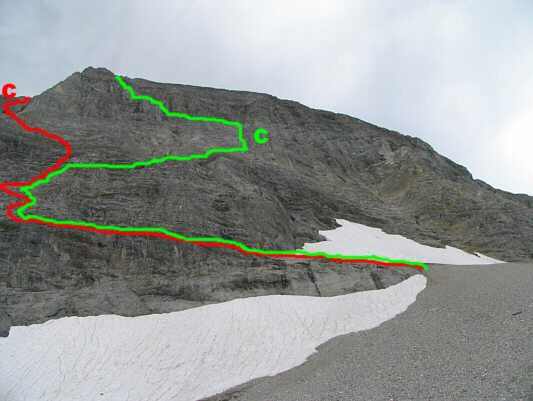 This is a foreshortened view of Sonny's approximate ascent (red) and descent (green) routes on the northeast face. The respective cruxes for both routes are indicated (c). Here is one last look at the northeast face from lower down. Warspite Cascades has a remarkable calming effect on scramblers after a hard day on either Mount Warspite or Mount Black Prince.